Communications Programs offer students instruction to prepare them for careers that focus on creating messages, images and videos that illustrate, educate, inspire and influence others. Students learn about emerging technologies, and earn valuable and marketable Adobe Certified Associate certifications in Illustrator, InDesign, Photoshop and Premiere. The Digital Media Production program teaches the art, craft and technology of film, video, animation and sound. Students can become Adobe-certified within three years, which provides an invaluable advantage in the job market after high school, or a spot in advanced college courses. Internships during junior and senior year expose students to the industry and provide hands-on experience in producing digital content. 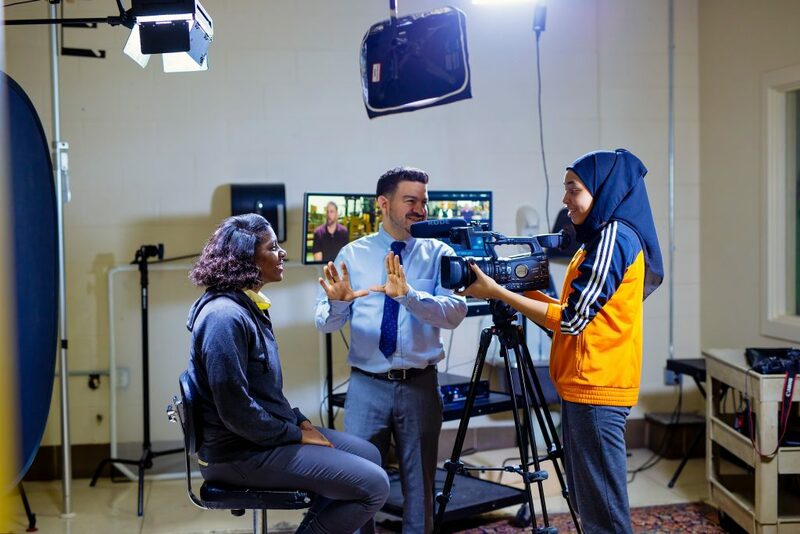 For students with an eye for the moving image and technical mastery, the Film and Video Production program is a great way to tailor high school learning for the future videographer. From classroom instruction in Adobe programs to hands-on internships and experience in the industry, students in this program learn the exciting tools and insight required to be professional film and video producers. Students in this program have participated in film festivals and other exciting opportunities that enhance the instruction and training of traditional coursework. Future graphic designers know how to make visual messages pop, convey meaning without text, and make text more descriptive with visuals alone. The Graphic Design program teaches the fundamentals of design along with the technical programs that are most relevant in this popular industry. Students can showcase both the skills they learn and their artistic talents through design competitions and internships. The Graphic Design program prepares students for work in the industry after graduation. Students enrolled in programs within the Communications Cluster can participate in many activities and experiences that relate to a variety of career goals outside of the classroom, such as film festivals and design competitions. Connections to professionals and employers in the industry give students the opportunity to take part in trips to local businesses, tours of local industry-related events and mock job interviews.